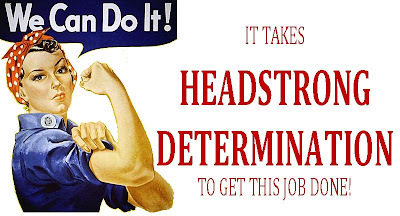 Healthy Loser Gal: Headstrong Determination! I don't know about for you, but for ME, the saying above really hit home! I do have HEADSTRONG determination when I put my mind to it. I *am* going to do this! I *am* going to rock the next 11 weeks with Vtrim and the Y! I *am* going to be a healthier, better version of myself. Negative thinking, fear of failure, old 'tapes' in my head... do you think you can stop me!? Just try! You're going to be hugely disappointed. Yeah, baby... it's Watch Out World multiplied by Irish will and German stubborness. Wow! Thats a great inspirational post! I am new follower of your blog and I really love the attitude! Lets get going! YOU ARE TOTALLY A ROCKSTAR! I love your fire and you are so going to be the best you!!!! Bookmark this post, so can go back to it later. These fiery feelings are fantastic rocket boosters to thrust us up into the stratosphere, and we fly high! Sometimes, later when we are NOT feeling it, we can still keep going by that very same useful stubborn determination, until we IGNITE again, and the feelings catch up with us. Your motivation keeps me going. You are an inspiration!